Siemens Solar RV Power Kits provide an easy-to-install, all-in-one package that gets you on the road to solar power—fast. Available in 36, 50, 75, and 100 watt versions, they're suitable for everything from trickle-charging batteries to powering appliances. Their modular structure means that you can add more panels to produce more power—paving your way to complete solar freedom! 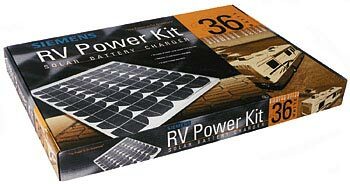 Contact Siemens Solar to learn where to buy your RV kit today.